The three rolls that constitute Australia Rolls were shot while on an excursion to Australia with my partner who was shooting digital video of our trip. 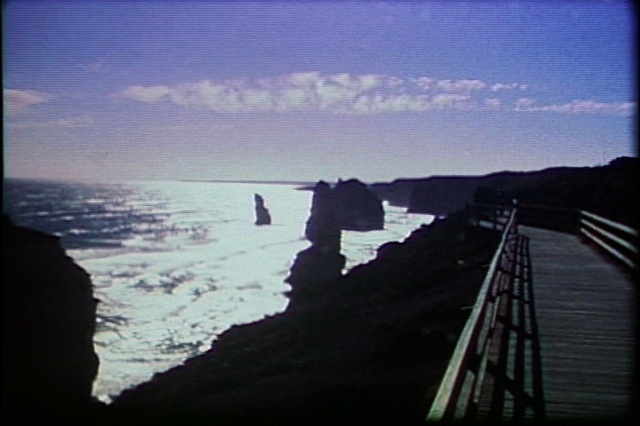 The first was shot at the Great Ocean Road, a popular natural tourist attraction in the state of Victoria; the second was taken at an eco-tourist island off the Queensland coast called Frasier Island; and the last reel was shot on Lady Elliot Island, a small coral atoll at the base of the Great Barrier Reef. Shown as a series they depict a searching desire for natural vistas as far removed from human presence as possible. In each successive location, the tourist experience of the landscape becomes as much of a focus as the landscape itself, and the filmmakers become implicated in their own fetishization of the vista.